The stage doesn't consist merely of actors. 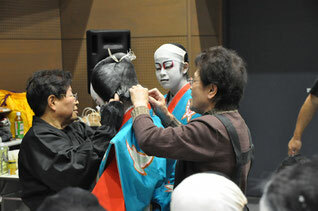 Ji-kabuki is supported by the work of many other individuals including stage set constructors, stage directors, makeup artists, hairdressers, costume directors, tayū chanters, shamisen players, stage assistants, geza musicians, and the families and friends of the actors on stage. This group assembles and reassembles the sets central to every ji-kabuki performance, often within a very short span of time. A job that requires brains in addition to strength. 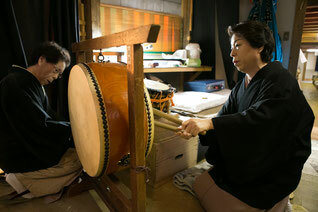 The accompanying musicians who play behind a bamboo curtain at stage left, consisting of nagauta shamisen, taiko drums, bells, and other sound effects. 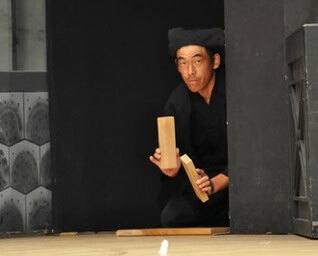 The individual who strikes the tsuke wooden clappers, and a specialist in making performances look better. 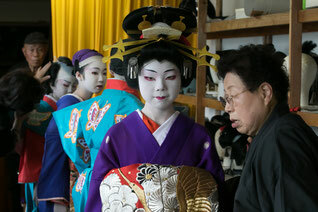 Applies standard kabuki makeup to actors, often in a short period of time. One artist can makeup over 50 actors at a single performance. 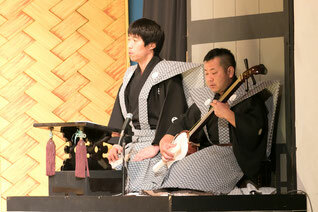 The Tayu and Shamisen are positioned in the right side of the stage and provide narration and music for the play. These individuals choose exactly the right costumes for each role and fit them to each actor. 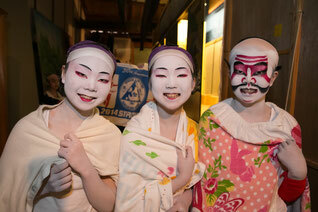 An important job, often fulfilled by the family and friends of ji-kabuki actors. 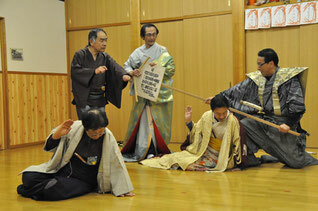 Actors also help out with performance preparations. 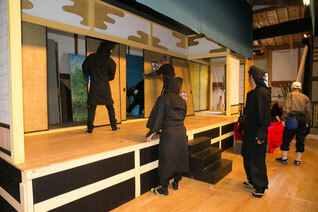 Many actors also help out as stage assistants on the day of performance.